As household gun ownership in the United States steadily declines, the firearms industry and gun lobby are targeting children as young as grade-school age as the next generation of customers. In a new study by my organization, the Violence Policy Center, we uncovered a systematic and industry-wide effort to market firearms to children as young as grade-school age. In recent years, these efforts by the firearms industry and gun lobby have intensified with little regard for the lethal consequences: the use of guns by children and teens in suicides, homicides, fatal unintentional shootings, and even mass murder. Much like the tobacco industry's search for replacement smokers, our study found that the gun industry is seeking replacement shooters. Along with the hope of increased gun sales, a corollary goal of this effort is the creation of the next generation of pro-gun advocates for future political battles. 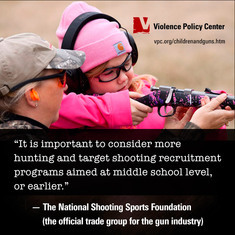 Groups involved in this effort include domestic and foreign gun companies, the National Rifle Association (NRA), the National Shooting Sports Foundation (NSSF, the gun industry's official trade association located in Newtown, Connecticut), industry trade publications like Shooting Sports Retailer, and the youth-oriented gun publication and website Junior Shooters. Below are 10 quotes directly from the firearms industry and gun lobby which begin to reveal, in their own words, the scope of this effort to arm America's children. More details can be found in our 54-page study, entitled "Start Them Young" - How the Firearms Industry and Gun Lobby Are Targeting Your Children. 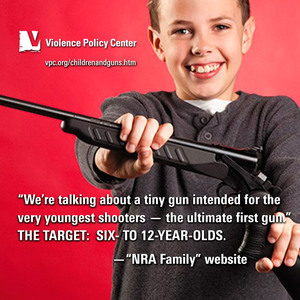 "[W]e're talking about a tiny gun intended for the very youngest shooters -- the ultimate first gun. 'We're targeting the six- to 12-year-old range....' With the number of hunters declining, it's crucial to get kids introduced to the sport as early as possible. 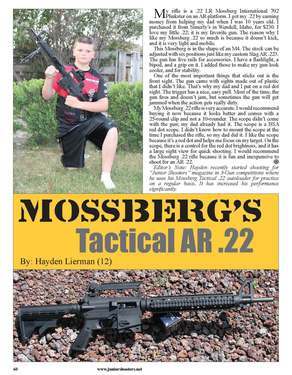 The HotShot [youth rifle] means that even the youngest shooters now have a gun sized just for them." 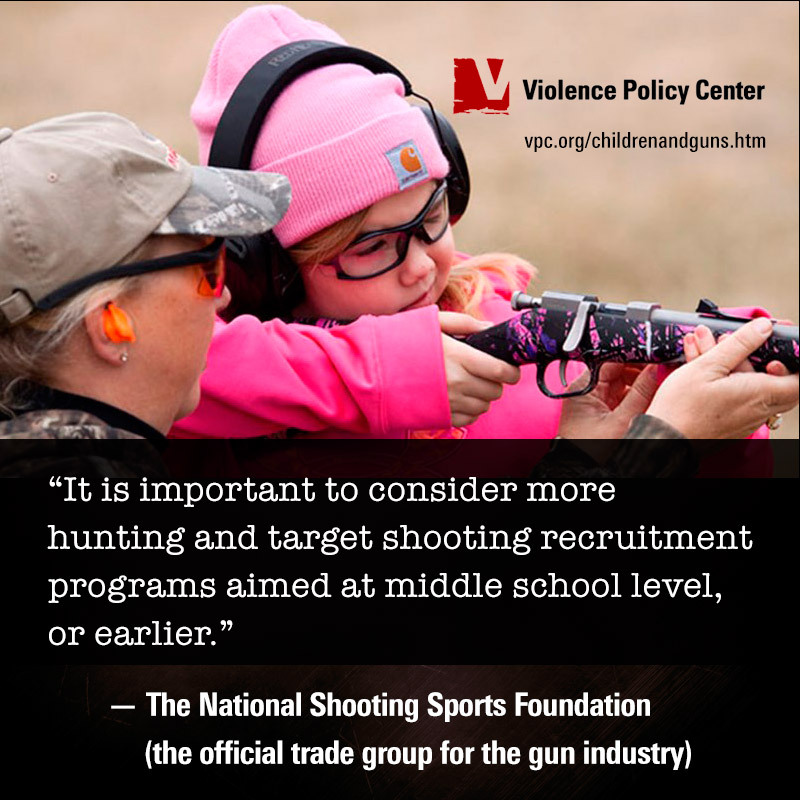 "To help hunting and target shooting get a head start over other activities, stakeholders such as managers and manufacturers should target programs toward youth 12 years old and younger. This is the time that youth are being targeted with competing activities." "It is important to consider more hunting and target shooting recruitment programs aimed at middle school level, or earlier." "If you're a kid looking for your first rifle, this is the gun you need to tell your parents about." "If we don't improve at cultivating new hunters and shooters, the sport we love and industry we work in will eventually die away. That's a strong diagnosis, but a realistic one. Like many enthusiast sports in this busy, competitive world, people are leaving faster than new ones are coming in -- and this is a recipe for industry-wide trouble down the road." "Lenin was famously quoted as saying 'Give me just one generation of youth, and I'll transform the whole world.' With this in mind, developing the next generation in the shooting sports isn't just a business decision: The survival of the firearms world depends on the political will of those who come after us, which is a direct result of their involvement in the shooting sports." "And of course, the problem with failing to recruit and grow is that numbers equate to political power. In an era when the private ownership and use of firearms, the right to 'keep and bear arms,' has come under increasing pressure, numbers and a young, vital membership are critical." "What market isn't tied to juniors? I really can't think of any. Military and law enforcement firearms have civilian versions which are applicable. The Concealed Carry Weapon (CCW) market has firearms which hold 10-rounds which is the limit for IDPA [International Defensive Pistol Association] competition. 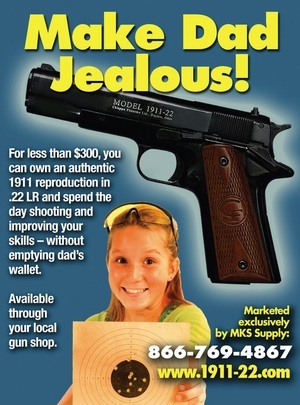 When the junior turns 21 they can get a CCW permit. What do they buy? It is usually a gun from a manufacturer they are familiar with." "[Y]outh ambassadors and others should focus on getting newcomers to take a first step into target shooting through any means, whether a BB or pellet gun, paintball gun, or archery bow. The point should be to get newcomers started shooting something, with the natural next step being a move toward actual firearms. Initial interest, however, should be embraced in whatever form it presents itself."